Though you can hook gigantic Blue and Black Marlin in these prolific fishing grounds, Striped Marlin are the ones who steal the spotlight. You can find these majestic fish only a couple of miles from shore, and they won’t shy away from showing off their stripes, either. What they lack in size compared to their Blue and Black cousins, Stripies make up for in number – you can reel in up to a dozen on a full day fishing trip if you choose the right spot. 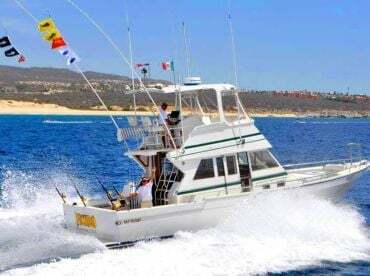 Cabo San Lucas is the crowning jewel of Mexico’s Baja California with its sapphire blue waters, breathtaking sunsets, and more amazing fishing spots than you can explore in a lifetime. Because the city is conveniently located at the intercept of the Pacific Ocean and the Sea of Cortez, you can find migrating Marlin here any time of the year, passing to the sea from the Pacific. The beautiful Los Cabos Marina is the main departure point, and from there, you usually don’t have to travel too long to get where Striped Marlin like to hang. Whale Head Point (Punta Cabeza de Ballena) is one of the best spots to target Striped Marlin, and you’ll find it just 4 miles from land. Gordo Banks is one of the reasons why Cabo San Lucas got its good name. These productive grounds are nested about 10 miles from the coast, and if you wet your line here, chances are, you’ll find a Striped Marlin at the end of it quite soon. 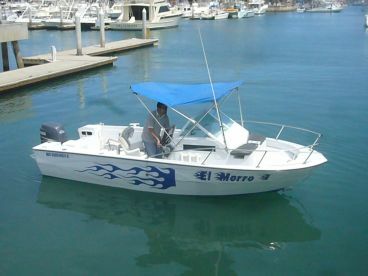 If you’d like to venture further out, 23 miles from the marina you’ll find the renowned 1150 Bank in the Sea of Cortez. 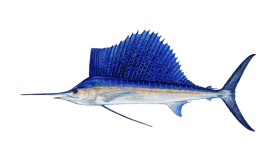 Striped, Blue, and Black Marlin often come here to feast, and this is exactly where you can hook one after the other when using live bait, which causes them to school and feed. San Jaime Bank is another fishing gold mine, located right next to the Tinaje Trough which measures 3,500 feet deep. With seamounts providing plenty of food and shelter, and the underwater current pathway that is a magnet for hungry pelagic monsters, this is the place to be when you’re hunting both Striped and Blue Marlin. If you ask local fishermen where they like to go for excitement on the rod, Santa Maria Canyon will definitely be one of their top picks. Because it’s only 9 miles from the sandy Santa Maria Beach, this Marlin honey hole is convenient to explore and it keeps on giving. 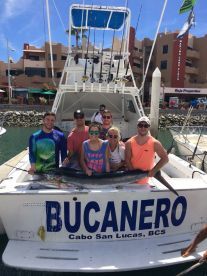 It’s always a good idea to go fishing with a knowledgeable guide, and there are many excellent Cabo San Lucas Marlin fishing charters to choose from. The local captains have their tricks and secret spots that will put you on some serious line melting action. 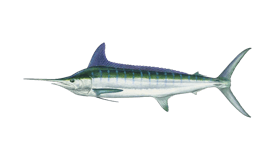 Striped Marlin can sometimes be picky about their food, and one of the best ways to attract them is with squid teasers. It’s important to know they won’t take the bait if it’s close to the boat, so use outriggers to widen your spread while trolling at a speed of up to 9 knots. The winning combo when you’re going after Stripies is to use Petrolero and Mean Joe Green lures. Because they’re so productive, these lures are among the locals’ favorites. If you want to get a taste of the Marlin fishing Cabo San Lucas has to offer in spring, you’ll have the biggest chance of success using rigged ballyhoo while trolling. Sight casting is one of the favorite fishing techniques in the area, because Striped Marlin usually stay close to the surface while looking for their next meal. The beauty and advantage of Cabo San Lucas is that you can come any time of the year, and reel in at least one Striped Marlin. Thanks to its optimal location and great weather, fishing in the area is fantastic whenever you decide to come. Striped Marlin is the unofficial symbol of Cabo precisely because you can go after it anytime from January to August and enjoy the stupendous drag-singing action. Other months are also productive, but winter months are the time for a stellar fishing expedition. Colossal Blue Marlin pass through these warm waters between July and the end of September, while Black Marlin stick around from July until December. 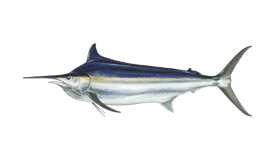 The Cabo San Lucas fishery is all but legendary, and Striped Marlin are the heroes. Prepare yourself and head out to experience some of the best fishing areas our planet has to offer. 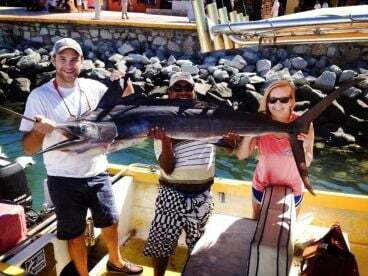 Marlin (Striped) fishing in Cabo San Lucas varies slightly throughout the year. High season is January to February and December. Low season is March to November. There is no closed season.